We would like to extend a formal invitation to you and your friends to join us for our upcoming customer appreciation day! 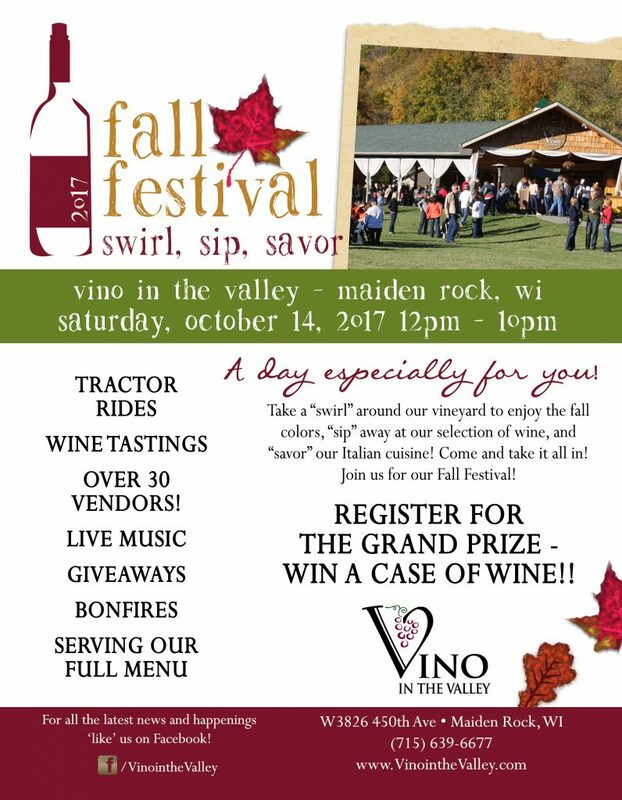 Join us Saturday, October 14, for Fall Festival: Swirl, Sip, Savor! We’ve planned a big event for you this year, full of activities, food, artisan vendors, and giveaways! And best of all, it’s dedicated to you – our customers. Be sure you’re following our Facebook page; we’ll be sharing updates about the event as the day draws near! We look forward to seeing and celebrating you! Join us for our Fall Weekends! This time of year not only brings a change of the seasons but also a change to our hours. Our summer hours (Thursdays-Sundays) continue through the end of September and then starting October 1 we transition to just Saturdays and Sundays. Join us this October from Noon to 10:00pm on Saturdays and 11:00 to 5:00pm on Sundays for family fun at Vino in the Valley! Kids young and old will enjoy hayrides around the vineyard. Enjoy our full menu on Saturdays; our delicious pastas, appetizers, salads, and desserts! And our famous buffet and brick oven specialties on Sundays. Get your fall Vino gear and wines in our gift shop. Visit our Farmers Market for late season veggies, honey and crafts from area artisans. And mark your calendar for our customer appreciation event; Swirl, Sip, Savor taking place on Saturday, October 14! Giveaways, vendors, food, entertainment, and fun! Vino In the Valley https://vinointhevalley.com/wp-content/uploads/2018/07/Vinointhevalleylogo.png Vino In the Valley2017-09-12 13:09:162018-09-18 16:19:00Join us for our Fall Weekends! 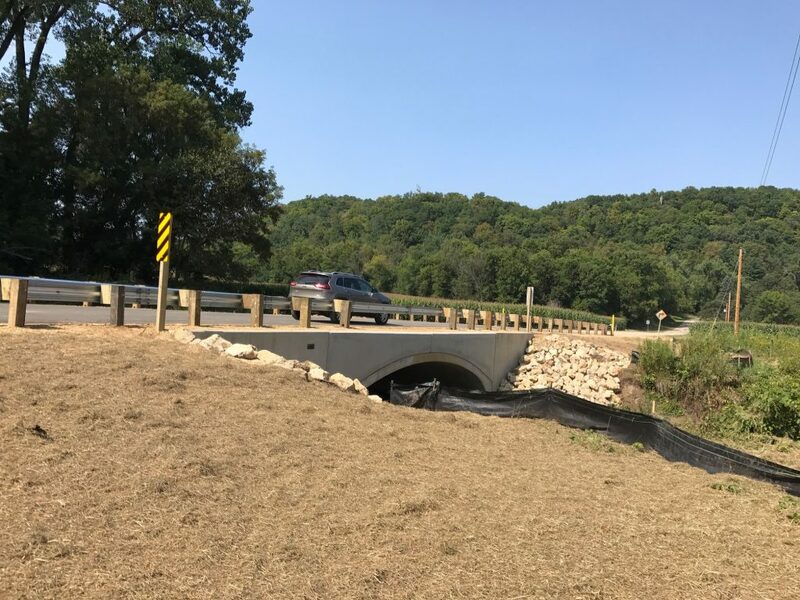 It only took 419 days but the bridge on 400th Street, the main access to Vino in the Valley, is now re-opened! For more details on directions, click here. Vino In the Valley https://vinointhevalley.com/wp-content/uploads/2018/07/Vinointhevalleylogo.png Vino In the Valley2017-08-31 19:34:152018-09-18 16:19:00Bridge Re-Opened! Those who know me know I’m a pushover for a beautiful view. One of my favorites, besides my own little piece of heaven here in the Rush River Valley, is an 11 mile stretch of State Hwy 95 between Fountain City, Wisconsin (the Mississippi river town) and the valley town of Arcadia. Referred to by the locals as “The Ridge”, it’s got a gorgeous view of the peaks and valleys of what is arguably one of the most beautiful areas in the state, Buffalo County. I was driving that stretch of road earlier this spring with friends and we made a random stop at a place called Hansen’s Hold Up. We couldn’t stop marveling at the view. We chatted a bit with the owners and discovered the property was actually for sale. Let’s just say, there was electricity in that moment. It was a feeling I recognized from before. It’s the exact feeling I had when the idea of Vino in the Valley was first conceived. Could we recreate a similar energy to Vino in the Valley above the valley? We’re going to give it a try! For 20 years Guy and Nancy Hansen have served a mix of locals and travelers great food and drink accompanied by a breathtaking view. We plan to continue their tradition serving a casual menu at the original bar (working name is Larry’s Lookout). Then Vino Over the Valley will be built adjacent to the existing bar, offering same “good vino, good view and good vibes” our guests have come to expect at our original location! We’ll officially assume ownership on September 28 and begin building an open air pavilion similar to our original. 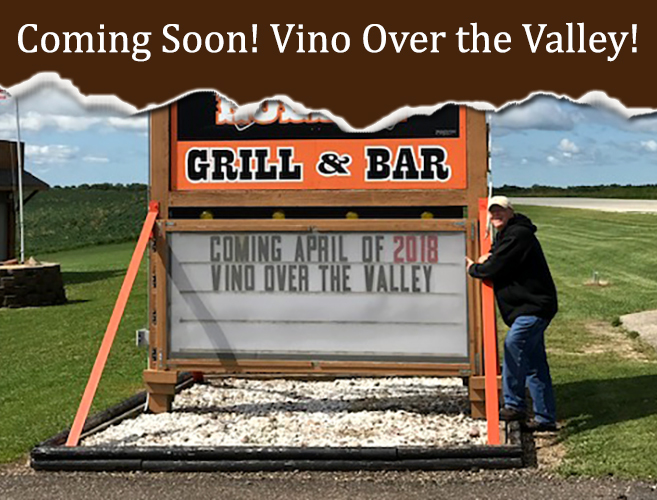 We hope to open as Vino Over the Valley in April of 2018. I can’t wait to invite you all down for a visit. Soon, regardless of whether you prefer your vino and views from up top, or down below, we’ll be able to offer both! As we near the end of August we’ll be saying goodbye to some of our staff as they head back to college. Thank you for a great summer, guys! Because of this, we have a few positions to fill. 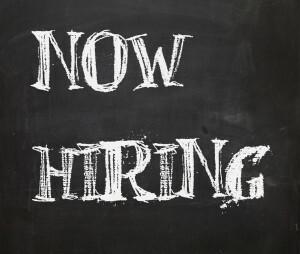 We’re seeking bartenders, front desk, and runners (and some other positions as well) who are enthusiastic and service-oriented. A great place to work during the most beautiful time of year. Plus employee discounts on food, beverage and gift shop, AND first in line for a more full-time job next season! We can be very flexible in hours and you can work 1-2-3- or all 4 days…it’s up to you! If you’re interested in joining our staff and working in a fun environment, please download an application here. Chef Clint is telling us that he’s ready to bust out of the kitchen and meet the fine folks that come to Vino in the Valley. We think he just wants to show off! 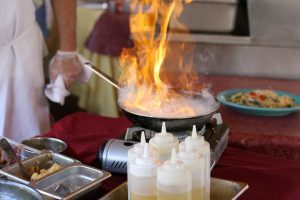 Regardless of the reason, it will be our guests who benefit most when our chef comes out of the kitchen for our “Flames and Fine Fare” event! Taking place Thursday evening, July 20, Chef Clint will be preparing two very special and unique dishes for our guests, right before their very eyes. A mobile kitchen will be set up in the middle of the Vino in the Valley pavilion, and our kitchen team will dazzle you by preparing Portabella Ravioli and a special Steak Au Poivre right out front! Our kitchen’s secrets will finally be revealed; you might pick up a trick or two (and finally find out the secret ingredient that makes your favorite dish taste so great!). You can expect a lot of flames, a lot of fun, and a lot of vino. Hmm, should we have a fire extinguisher on hand? This is a one-time event you won’t want to miss! Vino in the Valley and the Bella Sera patio bar hours will be 5pm-10pm. Groups of 10 or more can make reservations by calling 715-639-6677. 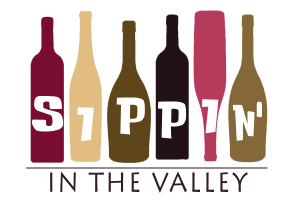 Vino In the Valley https://vinointhevalley.com/wp-content/uploads/2018/07/Vinointhevalleylogo.png Vino In the Valley2017-07-18 14:35:482018-09-18 16:19:00Flames and Fine Fare! 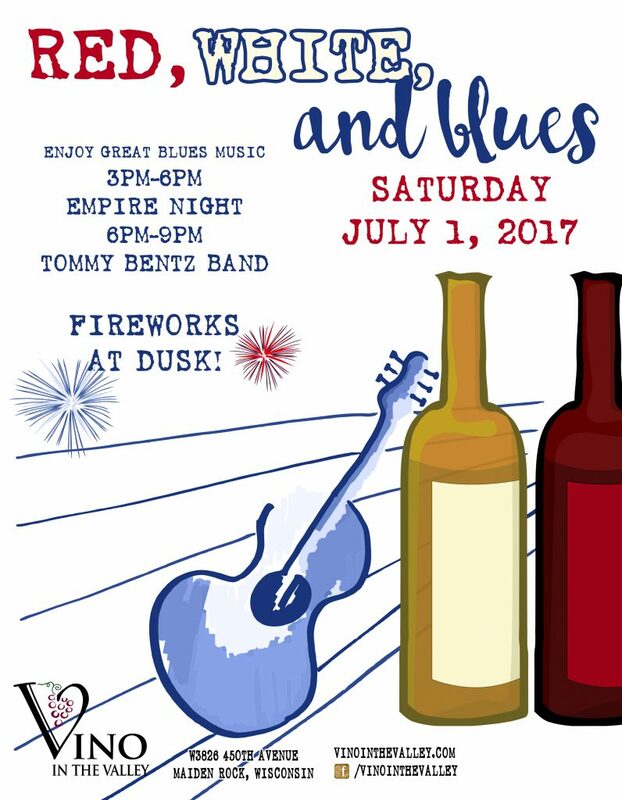 Great wine, delicious food, and awesome music… Commemorate the Independence Day holiday by joining us for Red, White and Blues on Saturday, July 1, starting at noon featuring the music of Empire Night and the Tommy Bentz Band with our famous fireworks show at dusk. Grab family and friends for a fun afternoon and evening in the valley. 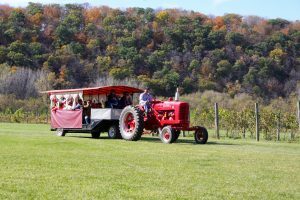 Take a tractor tour around the vineyard, enjoy a glass of wine or a beer on the patio, listen to blues music over a pasta dinner… Then grab your lawn chairs or blanket and settle in for the fireworks show after dusk! It’s a patriotic evening in the valley you won’t want to miss! New this year! Join us for our Fireworks BBQ! To accommodate our later arriving fireworks guests we’ll be serving BBQ chicken and all the fixin’s (1/4 chicken, garlic mash potatoes, baked beans, pasta salad. $15 (cash only)) plus a selection of beer and wine out on the grounds starting at 7pm! The last seating of the night will be at 9pm (our staff want to take in the fireworks, too!). There’s no admission charge. Sorry, no carry-on allowed on the grounds. Check out this entertainment line-up! A Duo with a Twist! Featuring both guitar and keyboards with smooth vocals and great harmony, Empire Night plays a smart, hip selection of music from contemporary pop and folk, great 90’s songs, and select 60’s and 70’s piano songs you haven’t heard in a while (think Captain and Tennelle, Burt Bacharach, and Sergio Mendes). The Tommy Bentz Band is a trio that often gets described as Van Morrison meets the Allman Brothers. Led by singer-songwriter Tommy Bentz, one hears strong soulful vocals with tasty slide and lead guitar, a rock-solid rhythm section with tight vocal harmonies that often makes the listener think that as many as 5-6 people are on stage. The band tours around the Midwest and yearly to the UK, for their annual fall tour, playing 2 blues-rock festivals in Ireland and Scotland this September. Enjoy blues and blues rock classics from artists like Clapton, Allman Brothers, SRV, The Band, Freddie King, as well as songs from their 4 original albums. We’ve added 5 new wines and 6 new craft-style beers to the menu at Vino in the Valley this season. That’s a lot, and with such a new and expanded list of selections, it seemed logical to have an event that would allow you to sample them. Join us for a special tasting event at Vino in the Valley on Saturday, June 10, from 3-5pm. During the “Sippin’ in the Valley” event, our staff will be on hand to offer samples of our newest wines and beers, make recommendations based on your tastes, and answer your questions, too. Simply purchase your tasting card at the bar (2 cards for $5 – 5 tastings per card) and then head out to visit our tasting tables. Feel free to be leisurely; there’s no hurry… Meander around the vineyard, enjoy a tour by horse-drawn wagon, visit the gift shop and farmer’s market vendors, or engage in a round of ladder golf. Be sure to turn your card in when you’re done for a chance to win four $50 gift certificates! Bring your group of fun friends; because wine and beer tasting is serious business (wink, wink). After the tasting, we hope you’ll stay behind and enjoy the balmy summer evening, have dinner under the pavilion and tap your toe to live entertainment by Stacy Jane and the Fermenters (how fitting!). 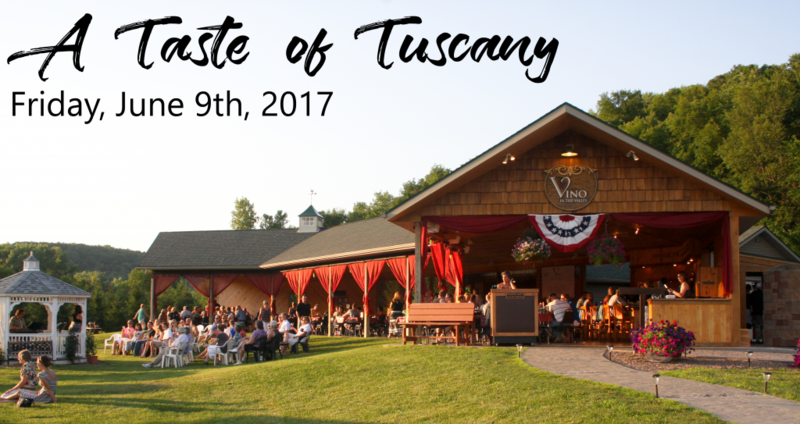 Once again we’re thrilled to be hosting the Ellsworth Community School District Foundation’s annual fundraising event, “Taste of Tuscany”. The event, which will be held at Vino in the Valley on Friday, June 9, 2017, supports the Foundation in their mission to enhance educational opportunities within our community using private revenues. In a time of ever-tightening budgets, supporting this great cause has become more important than ever. Social Hour begins at 4:30pm with the event officially kicking off at 5:00pm. Attendees will enjoy the music of Colleen Raye, a wine tasting, silent auction, and of course, great wine and a delicious dinner buffet. Tickets are $35 and available at Vino in the Valley, Ellsworth School District Office, Nilssen’s Foods, and from Foundation board members. Download an official event flyer here. Some amazing items on the silent auction again this year! We not only wish to encourage you to purchase your tickets and attend this worthwhile event, but also want to be sure all our guests are aware that due to this event, general seating for the public will not begin until 7:30pm on Friday, June 9. Our outdoor bar, Bella Sera, will be open beginning at 5:00 pm if guests would like to come down to enjoy some wine until seating begins; although you’re always welcome to purchase a ticket to the event on the spot and join us! Your help in spreading the word to your friends and neighbors is always appreciated. Thank you and we look forward to seeing you. It’s quickly becoming a springtime tradition for folk, blues and bluegrass music lovers from around the region. 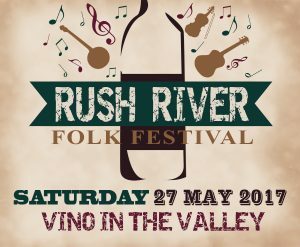 This year’s Rush River Folk Festival will take place at Vino in the Valley on Saturday, May 27 (Memorial Day Weekend). The event features over seven hours of live music from top regional artists, and admission is free! This is our 4th annual event and our way of welcoming the warm days of summer to our valley. We kick off the music at 1 pm and don’t stop until the sun sets. With the beautiful valley views as their backdrop, musicians offering a grand mix of sounds and styles of folk music serenade our guests all day long while they enjoy wine, beer and our Italian fare (our pavilion will open at noon this day for lunch). Wagon rides around the vineyard and lawn games pass the time between music sets. As the sun falls behind the bluffs and the cooler evening temps roll in, roaring bonfires take the chill off the air. This year’s music lineup includes several talented performers who are making their first appearance at the festival. This year’s headlining artist is Chastity Brown, an internationally touring folk artist with roots in Minneapolis, but a sound with many regional influences. A multi-talented musician who has performed on saxophone and drums as well as guitar and vocals, Chastity comes to Rush River after stops in New York City, Arlington, VA, and Philadelphia. In 2016, she toured with folk icon Ani DiFranco, and she has recently been featured on National Public Radio’s “Favorite Sessions” and on American Songwriter. Her newest recording, Silhouette of Sirens, is soon to be released on the standout Twin Cities label, Red House Records. Chastity’s musically imaginative and socially inspired style of folk music is sure to provide a memorable performance. We are also thrilled to have Jerrika Mighelle joining us this year on the Rush River stage. 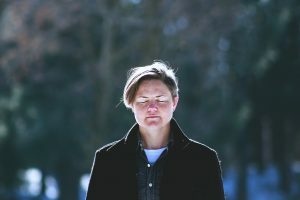 Jerrika is well-known in the region for her performances with Quinn Elizabeth, a sister-folk combo that has made many musical contributions to the Chippewa Valley folk scene. Jerrika’s set at Rush River will include songs from her debut solo CD, Like The Sea, released in 2017. Over the past year and half, Jerrika has perfected her songs at local live shows and open mic appearances as she explores themes of self-discovery, professional transition, personal tragedy, and the guiding lights that can lead us further on our journeys. Also part of this year’s Rush River lineup are two additional folk acts with deep roots in the Western Wisconsin music scene. Eggplant Heroes contributes an opening act for the festival. They are an Americana musical group led by Duffy Duyfhuizen, featuring original songwriting along with traditional folk, gospel, and roots music in the string band tradition. Their live set features songs from their two recent CDs, After This Time and Better Weather. 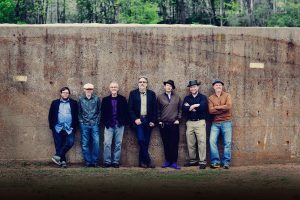 The group often features Caleb Horne (mandolin), Dan Zerr (bass and vocals), Joel Pace (trumpet and vocals), Lucas K. Fischer (guitar) Max Garland (guitar and vocals), and Olaf Lind (violin), for a signature folk sound. Of course, the festival would not be complete without a set by Davey J and Jen Hazen. Davey J is the one who first approached us with the idea for a festival and the one who selects and organizes all the amazing musical acts. Davey J is a scholar (a professor at UW-Eau Claire) and a prolific musician and songwriter whose style ranges from roots to rock, blues, and jazz-influenced pop, delivered with a signature guitar and vocal style. Davey J is well-known for his many performances over two decades as bandleader, guitarist, and vocalist for Davey J and the Jones Tones, and his more recent combo, Davey J and Friends. He has produced five CDs of original music and plans to produce his sixth in 2018. The title track for his most recent CD, Chippewa Love, can be heard frequently on Blugold Radio, 99.9 FM, in the Eau Claire area. Vocalist Jen Hazen has been a steady musical partner with Davey over the last few years, along with her performances with Jenny and the Jets, who are known for their live band karaoke shows that have incredible musical variety. Jen is working on a new CD that is tentatively titled 100% Locally Grown, which is a musical collaboration with Chippewa Valley songwriters such as Catya, Greg Gilbertson, Sue Orfield, and Davey J. Jen Hazen’s power and versatility as a vocalist will be on display as she performs a range of music by Chippewa Valley artists, in addition to several other styles. Yes, a full seven hours of live outdoor music will be the perfect way to start the long Memorial Day weekend. Bring your lawn chairs or blanket and settle in for an afternoon of music, wine and food. Again, there’s no admission charge; just come and savor the amazing sounds and a glass of wine or a beer on the edge of the beautiful Rush River. If the mood strikes, stay for an Italian dinner under the Pavilion, or order a brick oven pizza to-go and enjoy it on the grounds. Heck, make a weekend of it; you’ll find we have some amazing lodging options in the area! As always, the latest in event updates and announcements can be found on our Facebook page.